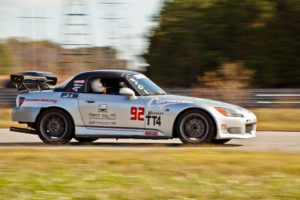 Tidewater Sports Car Club runs track events in the form of High Performance Driving Education (HPDE) and also Time Trial (TT) events. These are higher speed events held on road courses and/or vehicle testing facilities and have stricter safety standards. Each type of event (HPDE or TT) also has it’s own supplemental rules which must be adhered to. These are high speed continuous lapping events on a track with multiple cars at a time (up to about 20) with the goal being to teach and learn high speed driving techniques in a safe environment. Point-bys are given to cars that have caught up to you, and you must give a point by before anyone may pass you. 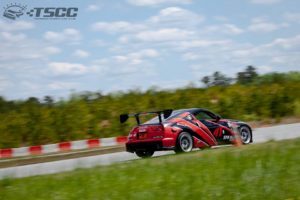 Green (Novice) – Instructor required, little or no track experience. Limited safe passing zones. Will attend a few classroom sessions when not running on track. Yellow (Intermediate) – Instructor may or may not be required, you can be “solo’d” off in this group. To be solo’d you must demonstrate safe driving habits, smooth driving inputs, situational awareness, not holding up traffic (failing to give point-bys when appropriate), and driving technique good/safe enough to continue learning on your own. You will be observed by other instructors on track. There are still limited passing zones, but there may be additional zones given beyond those permitted in Green group. Will attend a few classroom sessions when not running on track, may have one driving session in which passing drills are performed, to be explained in a classroom session beforehand. Blue (Advanced) – No instructors. Unlimited passing anywhere on track *with point bys still required*. You’ve got several HPDEs under your belt, excellent situational awareness, safe and smooth, can play nice with heavy traffic no matter the speed differences in cars without holding others up. Sometimes may be combined with our White (Instructor) group. White (Instructor) – You ARE an instructor and drive with the same requirements and level of skills of the Blue (Advanced) group. The difference is you agree to instruct up to two students (Green and/or Yellow), for which in exchange you get free track time. We are always looking for more people to add to our instructor pool, if you are interested please email trackevents@tidewatersportscarclub.com. Vehicle requirements: Most vehicles are perfectly fine and capable of running an HPDE. It does not matter how “fast” your car is. It must have a pre-event safety inspection performed beforehand… You can view the HPDE Tech Inspection Form HERE. In a nut shell you need to make sure the car has brakes, suspension, and tires in good condition, no leaks, seat and seat belts/harnesses in good condition and mounted correctly, etc. We have one of the more strict tech inspections vs many others, as safety is a top priority. Event requirements: The latest version of our HPDE Supplemental Rules can be viewed HERE. It contains driver requirements, event procedures and information, plus further clarification on vehicle tech inspection requirements, rollover protection standards, and harness mounting. These events we run are not like other organizations’ Time Trials… these are like a blend of autocross and road racing in which they are performed from a standing start, drive one continuous lap of the course, and run through finish beams. Think of it as an autocross at higher speeds with no cones. It is a GREAT way to get your feet wet with higher speed track driving without the worry of multiple cars on course, passing/point bys, and the wear and tear that continuous 20 minute sessions put on a vehicle. It also provides some intense competition among drivers (unlike the HPDE which is a driver school). Vehicle Requirements – The same basic safety rules of a typical autocross apply, but with the addition of our convertible rollover protection requirements as set forth in our Time Trial Supplemental Rules. Classing – In the past these events have used Novice, Ladies, Street Tire, and Open/Race Tire classes, and that was it. New for 2018 we are implementing a simple Time Trial Classing Calculator to classify vehicles “A” through “F” plus “U” (Unlimited). This is currently in an experimental phase. The main goal is to have cars with relatively similar performance potential in classes with each other, as opposed to a C7 Z06 and a 1.6L Miata in the same class just because they are both on street tires. All sign up as General Competition or with a Novice (N) marking for their class. While all drivers in a given class (General Competition and Novice) will be scored together, the fastest novice in each class will be recognized when trophies are presented at the end of the day if applicable. There is no longer a dedicated “Ladies” class, but the fastest lady at the event will be recognized as well.